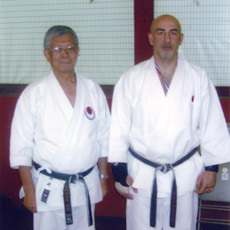 Mr. Raiola is currently 5th Dan and is Chief Instructor of Mushin Dojo. A certified black belt and qualified instructor, he is a member of the International Shotokan Karate Federation (ISKF), and the All New York Karate Association (ANYKA). 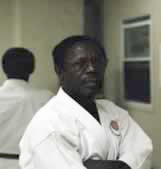 He has been teaching Shotokan Karate for over 20 years. His present Instructors are: Chief Instructor of ISKF, Master Teruyuki Okazaki 10th Dan, and Chief Instructor of the ANYKA, Sensei Maynard Miner 8th Dan. Master Okazaki along with Sensei Miner are among the first to teach this traditional Japanese Martial Art in the US. Our organization is international and is sanctioned by the Japanese Ministry of Education, teaching traditional Shotokan Karate as directed by our founder Gichin Funakoshi. Kyu (Rank) Exams are given quarterly by certified instructors. The results are recognized by world-wide organizations.